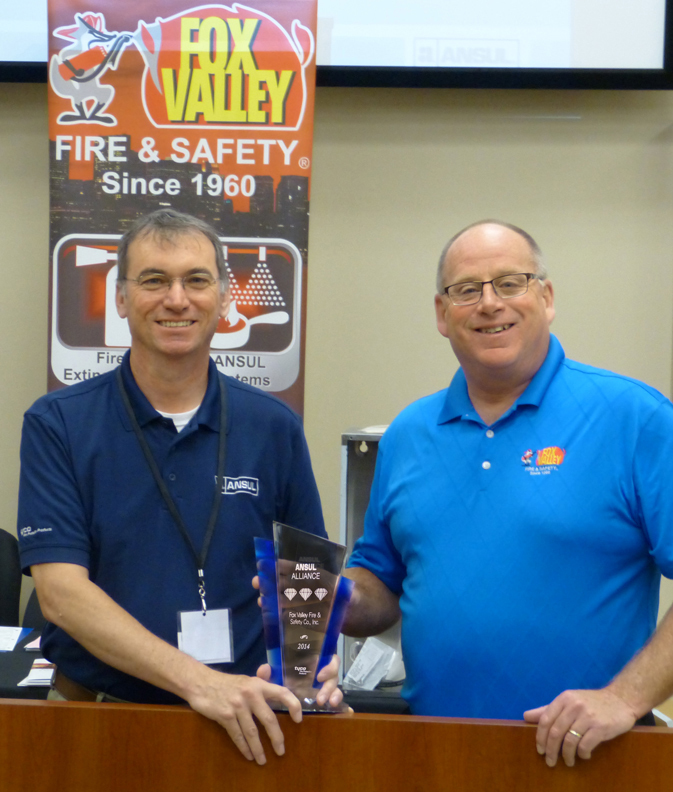 February 22, 2019 – Emergency24’s President/CEO – Dante Monteverde and VP Operations – Steve Mayer presented recognition to Fox Valley Fire & Safety as a 2019 Platinum Level Partner. September, 2018 – Distributors from all over the globe converged in Marco Island, Florida for NOTIFIER’s 32nd Annual Leadership Conference. Representing Fox Valley Fire & Safety were Scott Volkening, and Ken Volkening – President. We proudly accepted our 14th consecutive Million Dollar recognition award. 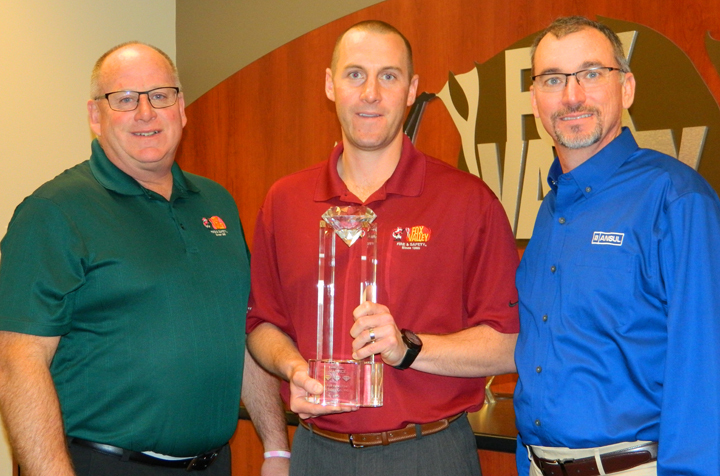 May 22, 2018 – Jay Hansen, ANSUL Territory Manager presented Jim Moran, Fox Valley Fire & Safety VP of Sales, and Jim Moran Jr., Sales, with the Triple Diamond Distributor Award. 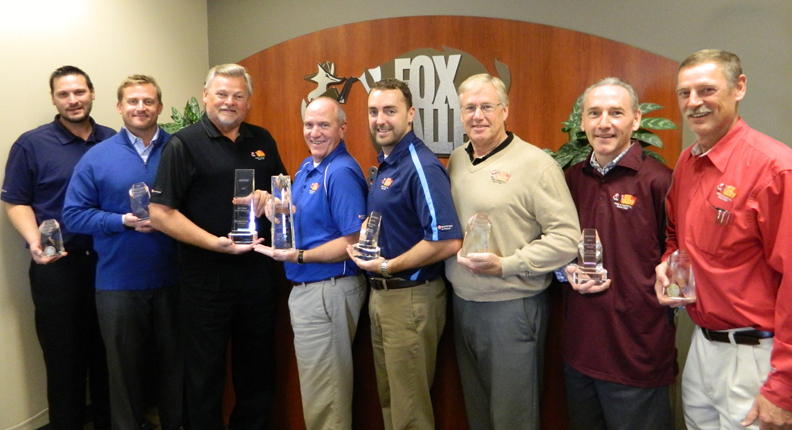 Fox Valley Fire & Safety is one of only two Triple Diamond Award Distributors in the Midwest Region. 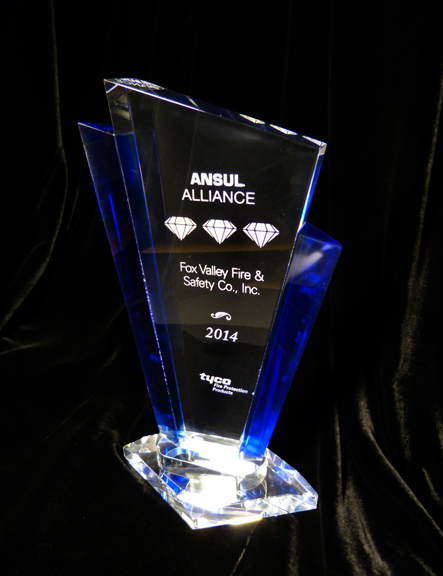 The Triple Diamond is the highest Distributor Award given from ANSUL Fire Prevention Products and is a testament to the hard work put forth by Fox Valley Fire & Safety over the past year. 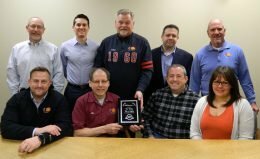 This is Fox Valley Fire’s 22nd consecutive Triple Diamond Award. October 14, 2017 – Distributors from all over the globe converged in Arizona for NOTIFIER’s Annual Leadership Conference held on October 12-14. Representing Fox Valley Fire were Dave Matousek, Scott Volkening, and Ken Volkening- President. We proudly accepted our 13th consecutive Million Dollar recognition award. April 1, 2016 marks the beginning of Fox Valley Fire & Safety’s relationship with NOTIFIER as a Premier Distributor. While we have been a leading distributor in the Chicagoland market for decades, the Premier status clearly sets us apart. Beginning this year NOTIFIER awards the Premier status to those distributors who show higher levels of capability and performance. The Premier Distributor title reflects our leadership in our industry. We are recognized as being expertly trained in the design, installation and maintenance of NOTIFIER equipment and solutions. Distributors from all over the globe converged on the great city of San Antonio, Texas for NOTIFIER’s Annual Leadership Conference held on October 11-14. Representing Fox Valley Fire were Scott Volkening, Ken Volkening- President, and Dave Matousek. 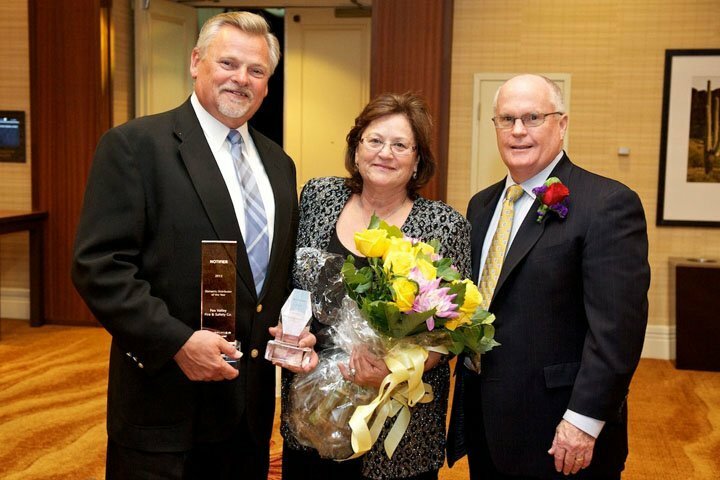 We proudly accepted our 11th consecutive Million Dollar recognition award. “Bringing home the award to share with all of our employees that have made this possible is what it’s all about” stated Ken Volkening. 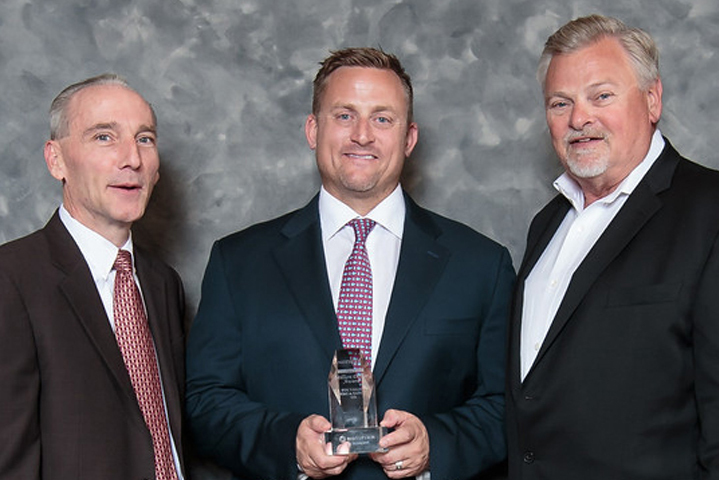 Jay Hansen, ANSUL Territory Manager presented Jim Moran, Fox Valley Fire & Safety VP of Sales, with the Triple Diamond Distributor Award September 14, 2015. 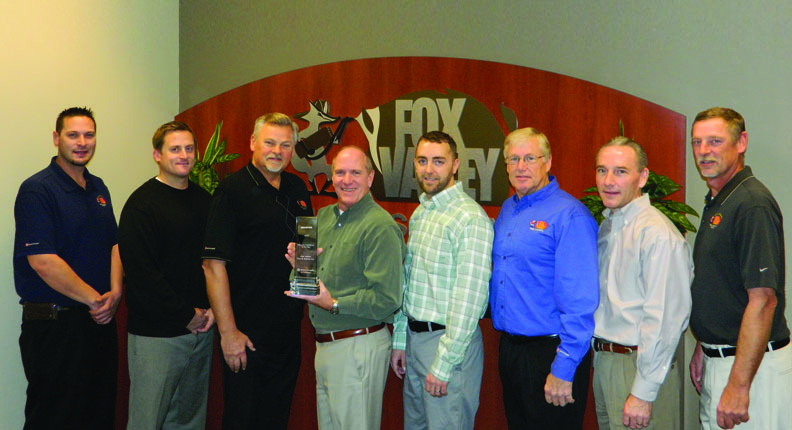 Fox Valley Fire & Safety is one of only two Triple Diamond Award Distributors in the Midwest Region. 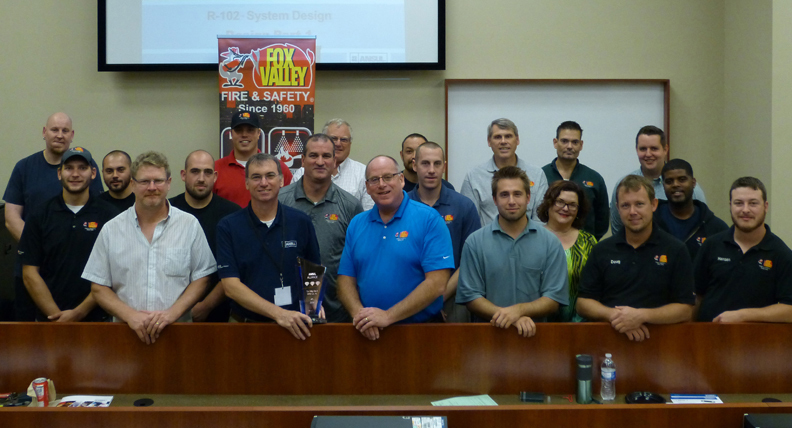 The Triple Diamond is the highest Distributor Award given from ANSUL TYCO Fire Prevention Products..
Installers, Service Technicians, Engineers and Sales Representatives all took part in the September 14th ANSUL training on ANSUL’s R102 Restaurant Fire Suppression Systems. Keeping all informed on new elements for the system allows Fox Valley Fire & Safety to sell, design, install and service the very best to their customers. 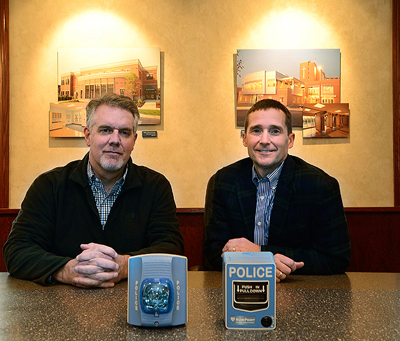 John McNutt and John Shales are the creators of the BluePoint Alert System, designed to speed emergency notification to police and alert others in the building. The system looks and acts similar to a fire alarm system. Blue pullboxes are installed throughout the building. When a box is activated, an alert is immediately sent to a call center, who then notifies the local police. In addition, an automated message is broadcast through the building’s public address system, and a text/e-mail alert is sent to a list of building officials. In areas where it may be difficult to hear a PA — like a school cafeteria or gym — a box with a blue strobe light is activated to give a visual cue that the alert has been activated, according to McNutt and Shales. 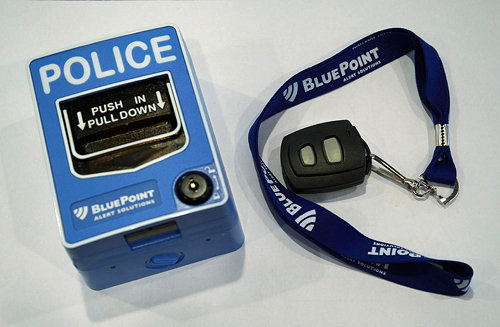 In addition, a remote activator is available and can be worn around the neck of key personnel, who can activate the system within a 2 mile radius of the building. To top it off, the entire system is wireless, so it doesn’t require installing an infrastructure to support it. 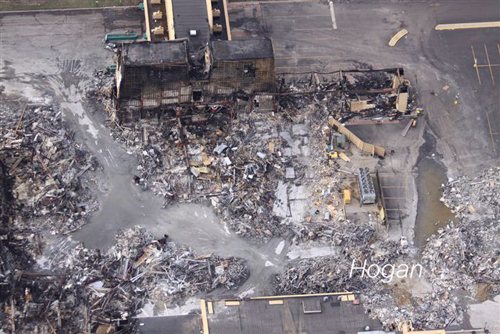 McNutt explains the genesis of BluePoint came shortly after the Sandy Hook tragedy, when he was talking with Central Community School District 301 Superintendent Todd Stirn. “(Stirn) said all buildings have fire alarms, we should do something for police as well,” McNutt added. “I came right back and talked with John (Shales).” After some further discussions with Ken Volkening of Fox Valley Fire & Safety, they developed the concept that became BluePoint, he said. 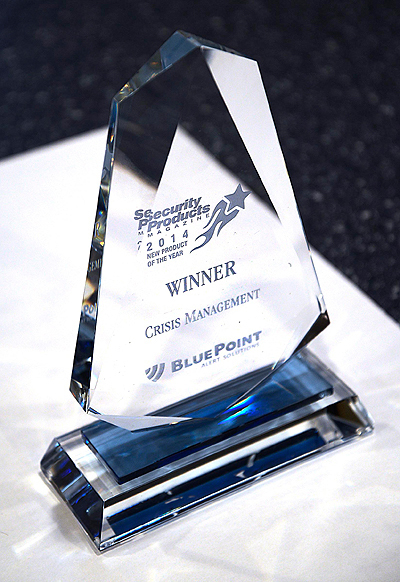 Since launching BluePoint in late 2013, they have installed about 30 systems in Arizona, Colorado, Illinois, Indiana, New Mexico and Wisconsin, and have about 12 projects pending, according to McNutt. He added that word-of-mouth and media attention has increased nationally as they add more buildings to their list. While schools are the main focus for the product, the system can also be used in other buildings, such as movie theaters, libraries or office buildings, where an additional level of security may be helpful. “The idea came as a result of school violence, but people are seeing it translated into many different types of buildings,” McNutt said. The bottom line, they stress, is that BluePoint is a way to prevent another school tragedy from happening. Copyright 2014 by the Daily Herald Business Ledger. Note: Edited from original article. Ken Volkening, Scott Volkening and Dave Matousek represented Fox Valley Fire & Safety at the Annual NOTIFIER Leadership Conference held on October 12 – 15 in Florida. 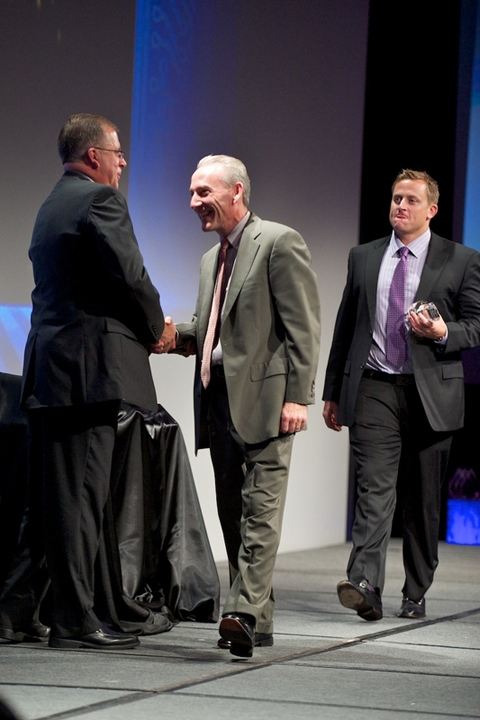 Dave and Scott accepted our 10th consecutive Million Dollar recognition award. 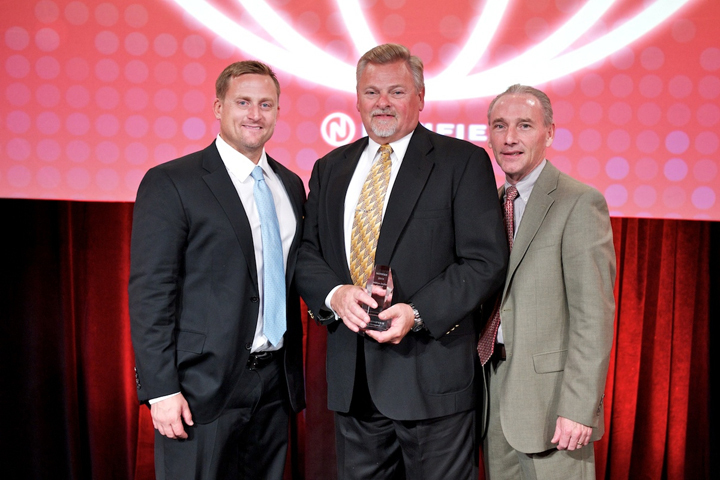 We are in select company this year as only 16 distributors in the nation received this recognition. 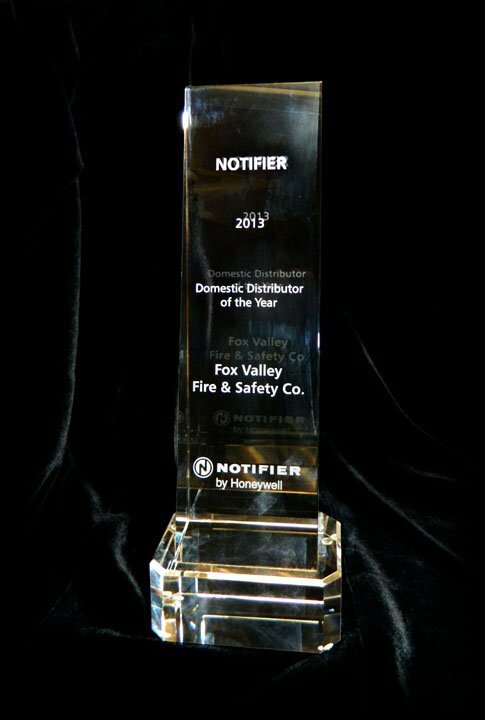 On October 15th, at the 27th annual NOTIFIER Fire Alarm Distributor Leadership Conference in Palm Springs (Desert) Fox Valley Fire & Safety was awarded the Domestic Distributor of the Year 2013. 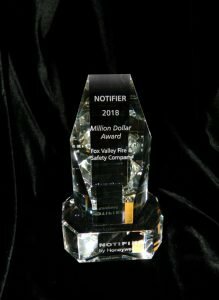 NOTIFIER by Honeywell, a worldwide leading commercial fire alarm, life safety and mass notification system manufacturer, awarded Fox Valley Fire & Safety the highly coveted Domestic Distributor of the year award in recognition of excellence in all aspects of providing comprehensive fire protection solutions. We were selected out of 460 distributors in the United States. “We are proud of our team and the remarkable difference our people make”, said Ken Volkening, President of Fox Valley Fire & Safety. “It’s a great honor to be recognized for our commitment and drive to provide exceptional customer service.” “I’m equally humbled and motivated by the effort of everyone in our organization”. ” We were also recognized with our 9th consecutive Million Dollar Distributor award for sales of NOTIFIER equipment in excess of One Million Dollars”. 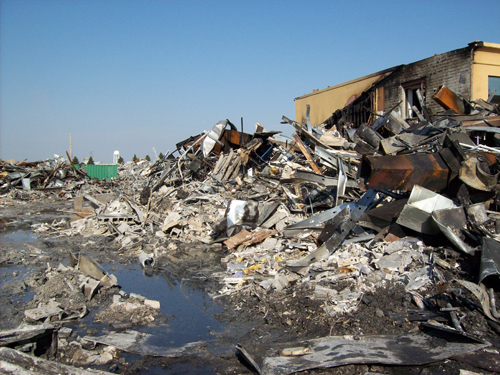 The devastating fire that completely demolished the entire former Empress Casino Pavilion on March 20, 2009 is an important reminder of the importance of properly functioning life safety systems. 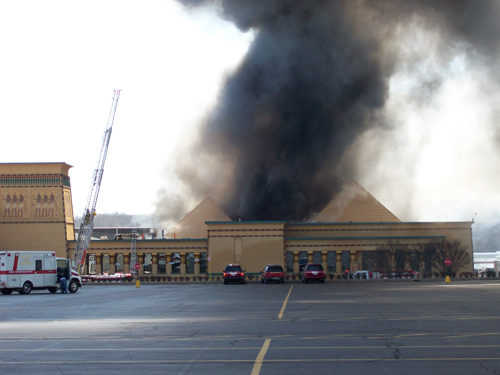 Prior to this fire, the Empress Casino was under going extensive remodeling in the pavilion. 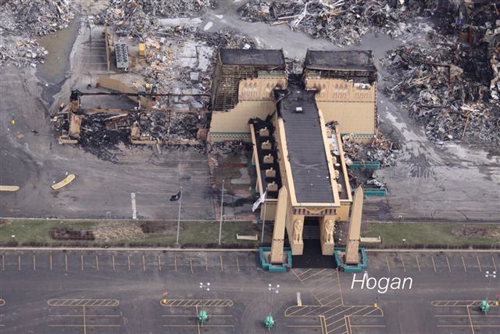 Fox Valley Fire & Safety was contracted by the Empress Casino to provide a new fire alarm system in the Pavilion. While new installation work was being done, it was brought to our attention that some horn circuits on the existing active fire alarm system in the pavilion had been accidentally disabled due to construction by other trades. In the event of a fire, these disabled circuits would not activate or provide proper notification. 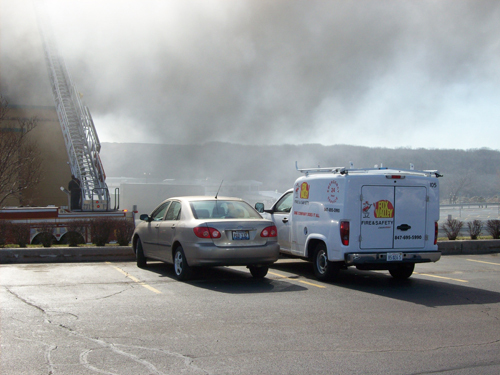 Fox Valley Fire & Safety Technicians were dispatched to troubleshoot the non-functioning horn circuits and get them back online with the existing fire alarm system. Through diligent troubleshooting to locate the problem areas, our technicians were able to successfully bring horn circuits for the first and second floor offices of the pavilion back online. 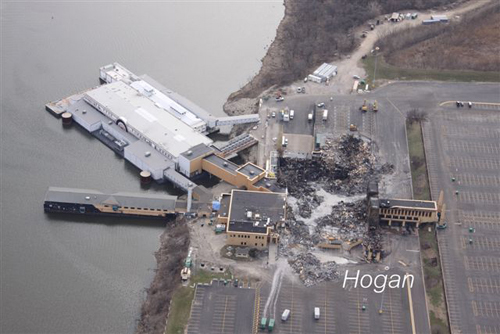 The following day a devastating fire broke out when many employees and contractors were working throughout the facility. 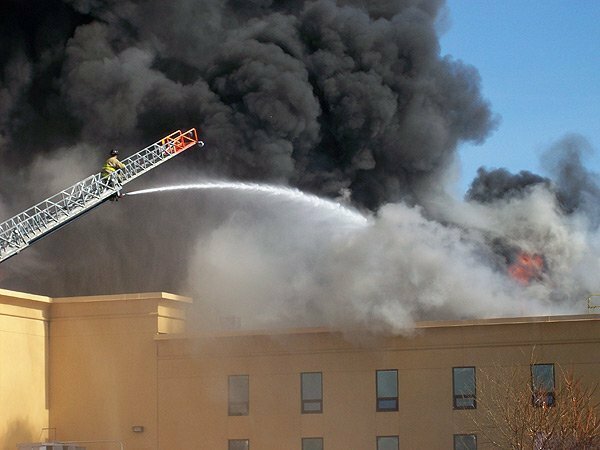 The fire alarm system activated and provided proper notification allowing everyone to evacuate without injury. 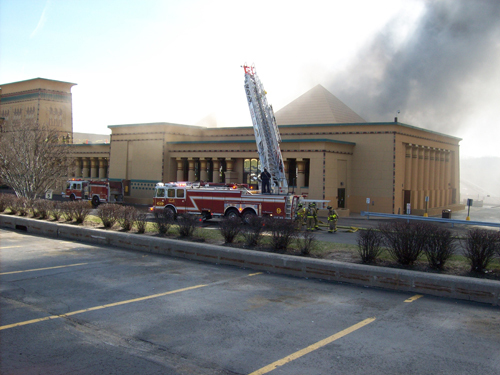 Although the pavilion was completely destroyed by the fire, tragedy was averted through a properly functioning fire alarm system allowing all to exit safely. 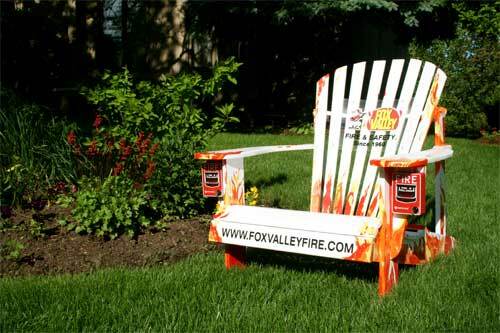 Fox Valley Fire & Safety participated in the Elgin Community Summer Event – Adirondacks – Thrones of Summer 2011. This is a public outdoor art exhibition of creative and unique works of art using oversized Adirondack Chairs as a canvas. There were 55 unique works of art on display over the summer in our community. All of the Thrones were displayed at the Art & Soul festival on July 30th and auctioned off with the proceeds benefiting Elgin Neighborhood projects. Our committee had a fun time decorating our entry titled “The Hot Seat”, and happy it has a new home while benefiting our city.